President Rodrigo Duterte flew in to Manila from Cagayan de Oro Saturday night, June 3, to go to the wake of some of the fatalities of the Resorts World Manila incident. 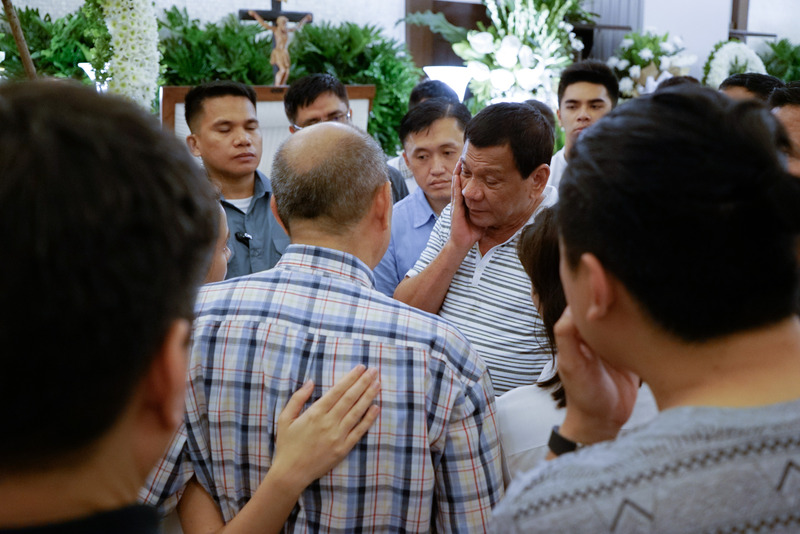 The President arrived around 11 pm to personally condole with the family of the victims in two funeral homes in Arnaiz Street in Pasay City and Heritage Park in Taguig City. In Veronica Funeral Homes, the Chief Executive met privately with the bereaved families of four of the victims, namely Hing Tung Tsung, Lai Wei-Chung, Lai Yu-Chieh and Carmelita dela Cruz. Around midnight, the President then went to the nearby Rizal Funeral Homes, also in Pasay City, to pay his respects to another victim of the incident, Eleuterio Reyes. He then proceeded to Heritage Park in Taguig to pay his last respects to Raoul B. Viray and Elizabeth Gonzales. Viray was a shipping industry official. Gonzales was the wife of Pampanga Rep. Aurelio Gonzales, Jr.
Malacañang had earlier expressed condolences to the victims of the Resorts World Manila incident. The Chief Executive himself dispelled speculations that the Resorts World Manila incident was a terror attack. “That is not the work of the ISIS. The work of the ISIS is more cruel and brutal. They would just simply kill people for nothing. Not even for a reason. And that was the reason why the world today has bonded together to fight the scourge of terrorism,” Duterte said.